Description: This is a 5-piece Original Little People Indy Racing team set. 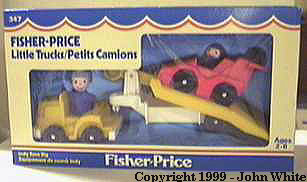 The set includes a truck, a trailer, a race car, and two Little People figures. The truck sold with this set is the same as the yellow truck sold with #344 Copter Rig. The race car and driver that were used in this set were also sold in 1985-1990's #2450 Race Car set. The only piece sold in this set that is exclusive to this set is the trailer that hauls the race car. The trailer has a ramp on the back to allow the race car to drive on and off the ramp. The trailer also has a yellow lever that allows the trailer bed to tilt. FPT491 - Yellow 1-seat truck wth a white front grill, white bottom, and white bumpers. The truck has a hole on the back to attach/pull a trailer. The truck rolls on 4 knobby wheels. FPT432 - Yellow top, White base tilting flat-bed trailer. Rolls on 2 "knobby" wheels and has a hitch on the front. The trailer has a ramp on the back, and a yellow lever that makes the trailer bed tilt. FPT438 - Small red single seat race car with a high backrest and a spoiler on the back. The car rolls on 4 black plastic wheels held on via metal rivets. MPP - Short black body race driver with black helmet. ASPP - Tall dark blue truck driver with white engineer hat and smiling boy face. *See Variations below. FPT733 - Yellow top, White base flat-bed trailer. Rolls on 2 "knobby" wheels and has a hitch on the front. The trailer has a ramp on the back (no lever that makes the trailer bed tilt). AQPP - 1989-1990 Fisher-Price dealer catalogues shows a tall medium blue truck driver with a medium blue engineer hat and a smiling boy face, oppose to a dark blue body and white hat. The race car and driver that were used were also sold in 1985-1990's #2450 Race Car set. FP347SET1983 - MINT in Box set - WFL: 07-AH-33-2-B.